Imagine being told why you are special and loved. 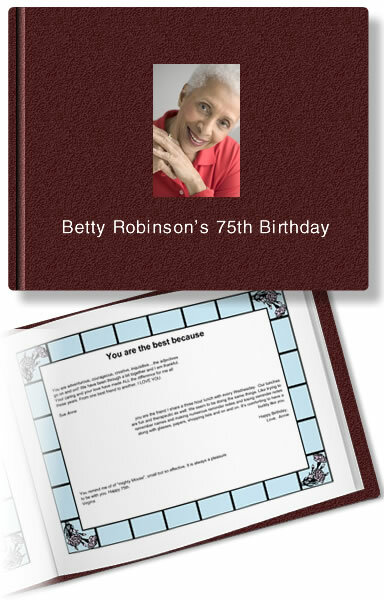 Celebrate someone’s birthday with a gift book that is filled with thoughts and wishes from family and friends. It’s the one gift that will be treasured forever! This is about giving the best present in the world — love and appreciation! Start A Gift Book Now! I made my first book for my husband’s 40th birthday. He LOVED it! He was so surprised by how beautiful it is, and how much time everyone had spent writing something for him. He shows it to everyone. He loves the pictures that people had included in his book. I especially loved hearing some of the stories that his friends and family contributed to his book – some that he had never told me. It was well worth everything, to see his face as he opened the book and started to read. I did a book for my father’s birthday. My reason for doing the book was my father had everything he would ever want, and if he did not he would buy it. The book gave his many, many friends and his family a way to say, “You’re Special”. Dad never really holds on to pictures, and the book was titled “The best of”. (his name) I found pictures of him as a baby, and pictures of his favorite relatives. Then the book went crazy with a trip down memory lane. I gave him the book on Sept 9th, his birthday. He called and told me “this was the nicest gift he had ever received”, (believe me, we all look for the perfect gift for him year after year). I just wanted to share with you the results of my Dad’s book. Dad was so touched — and the man never shows emotion! He said it was a “three kleenexer”! He said that he didn’t realize how many people truly cared for him, and what an impact he had on others. The book was something that was better than any extravagant purchase I could have made for him. I am not a very creative person and this helped me do something for my Dad that no one else has ever done. One side of our family is all ready creating a book for our reunion next year. The word is out!!!!!!! I have produced two books by CelebrateAHero in the past year. My first book was for my husband’s 40th birthday. I was so happy with how the book turned out. The participation from all our friends and family was so special, and the quality was beautiful. My husband was so humbled and surprised. He was adamant about not having a surprise party for his birthday. With Celebrate Somebody.com we brought the surprise party to him in a private and meaningful way that will be treasured by him forever. My second book was for a friend. His book was also received with a grateful heart, and he has told us how much the words of others have mean to him and will last him a lifetime. I love CelebrateAHero.com!!! I made my first book for my Dad’s 84th birthday. It was 38 pages of the best stories and pictures ever. We had a birthday dinner and presented his book to him. He sat and read every single page and choked back the tears. He said, “He never knew he had so many friends”. He laughed at all of the “remember when” stories…The book was a GREAT success. Since Dad’s book was such a hit I decided to make another book for my Mom’s birthday. Her book turned out to be 85 pages long. Also a great success! Well, I must love your books; because I started another book for a very good friend of the family for her birthday! All three books brought such joy to the person that received them, and for the people that contributed the stories in each book. This is the best idea for a gift since wrapping paper! Thank you for coming up with such a great idea! I promise, I will be back to make more books! WOW!!!!!!!!!!!! This was the best gift I gave my husband, ever!!!! It was for his 30th birthday. He was bummed that he would not get to celebrate with most of our friends and relatives because we were living far from them, at the time. This really made up for it. Especially, the intimacy of each person getting time with him on paper to tell him what he meant to them! Funny thing was that the ones who really got emotional and profound were men. Funny how being alone and not face-to-face can really open you up. Thank you so much for this incredible website, it has truly changed my husband’s life! You Rock! I want to thank you for providing me with the magical means of bringing my family virtually together for the occasion of my father’s 70th birthday. During times when we feel every dimension of the distance that separates us from our loved ones and when it is often next to impossible to be everywhere where you want to be, your web site provides the technology to lovingly bridge the distances and s hare ones feelings with those we care about most. I was overwhelmed with the out pouring of love and generosity that was showered on my father. He has been fighting a serious illness for nearly 25 years and it meant a lot to his near and dear ones to say how much each additional day of his life meant to them. Thank you for your service, for it has made a difference in my and my family lives.